2019 M+R Brunchmarks Study provides an in-depth analysis of key trends in consumption, quality, and wait times for the most indulgent meal of the week. What many suspected based on anecdotal reports has now been confirmed by the first annual M+R Brunchmarks Study: People will wait in line for a really long time for absolutely mediocre food as long as there are mimosas on the menu. The study was researched and created by M+R, a communications agency that works with nonprofits to advance their causes, and also really likes to eat breakfast foods but sometimes has a hard time getting out of the house before 10:30am on the weekends. This year’s Brunchmarks Study measures quality, wait times, and food and beverage consumption of 135 establishments that serve brunch. The establishments range from high-end restaurants to trendy pop-ups to the bodega on the corner. To be included in the study, an establishment must serve eggs (or vegan egg substitute) after 11am. Below are 3 top takeaways from the 2019 M+R Brunchmarks Study. The companion M+R Benchmarks Study, which includes comprehensive data on nonprofit digital programs but has surprisingly little to say about waffles, will be available for download at www.mrbenchmarks.com on April 25, 2019. 1. People will wait in line for really mediocre food. Overall, we found a weak correlation between wait time to get a table and quality of food. 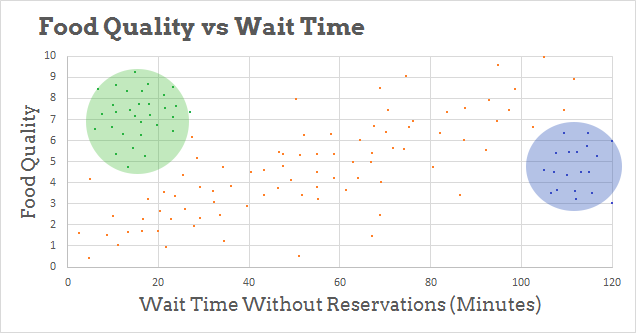 In some cases, restaurants without a wait (diners, bodegas, local dives) had worse food than restaurants with longer waits. However, some of the trendiest spots and those that have been featured on Guy Fieri shows had some of the longest wait times without exhibiting any particular increase in quality. Underground Gems. There was a cluster of establishments with very high food quality ratings without the long wait times. We call these Underground Gems. Think about a hole-in-the-wall that sells kimchi breakfast burritos prepared on hot plates. And before you ask: no, we will not tell you where to find these spots! Instabrunch. These establishments can generally be identified by the ratio of customers to geotagged Instagram posts. Of all the establishments we studied, Instabrunch locations tend to have the longest lines relative to food quality, which was generally below the industry average. Yes, this includes Drag Brunch. 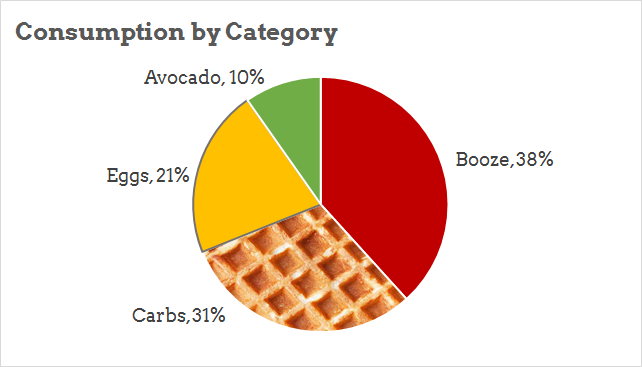 Economists have pinpointed avocados as the main financial stressor breaking the banks of millennials across the country, but when it comes to brunch things are not so simple. Given this breakdown, restaurants may want to think twice before adding that avocado toast to their menu. 3. Which city is the Brunch Capital remains a subject of debate, but we can say with 100% certainty that it is not in the Bay Area. We’ve established that people wait in line for food that is objectively so-so. That’s indisputable. The real question is: why? According to the Brunchmarks Study, regional differences may be at least part of the answer. Our findings indicate brunch culture varies greatly city by city, but by far the biggest outlier hails from Northern California. That’s just how the egg yolk runs. We surveyed over 100 people who happen to live in the four major metropolitan areas where M+R has offices (New York, Boston, Oakland, and DC, if you or someone you know is looking for an exciting career opportunity). It became strikingly clear that in the Bay Area**, brunch does not have a clear definition, let alone the rituals and routines that would help to define a viable “brunch culture.” While some restaurants will serve you eggs after 11, you likely won’t be there to eat them. Only 15% of Bay Area participants reported attending a brunch in the last year, citing “smoothie and a hike,” or “East Bay potluck” as alternative options. New York participants insisted that if you know, you can find something good, with a low wait time, great food, AND a dog-friendly environment. Data is inconclusive on what one must know for this to be true, as no participant was willing to elaborate. Thus, we cannot report with statistical significance that New York outperforms other cities, though every single participant from this area insisted that New York is the best place for brunch and also for everything else, but that it’s impossible to “get it” until you actually live there. Beyond that, results were fairly consistent across our other cities. You likely will need a reservation, but not always. Brunch isn’t earlier than 11, but is often later. Restaurants are always trying to get you to order some strange variant Eggs Benedict with unorthodox ingredients like crabcake or sriracha honey or quick-pickled jackfruit, which always sounds better than it ends up being. In the end, we found no single approach that will guarantee an exceptional, or even satisfactory, brunching experience. It’s up to all of us to keep striving, keep searching, and keep texting our friends to say we’re going to be a little late. Well after we concluded our data collection and analysis, breaking news from St. Louis caused us to reassess the very nature of brunch, and to reconsider whatever optimism we might have had about the future of human civilization. 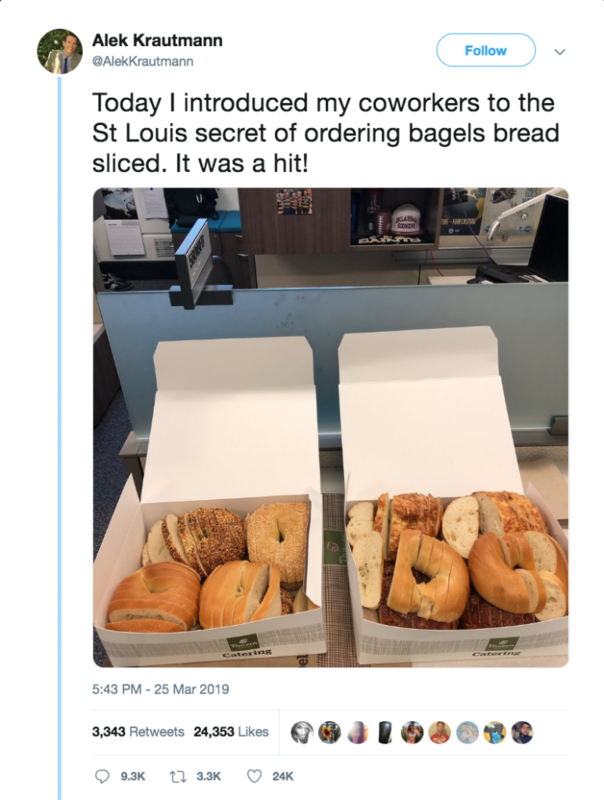 We are referring, of course, to the outrageous and obscene practice of slicing bagels like sandwich bread. While this shocking revelation came too late to influence this year’s Brunchmarks Study, we look forward to exploring the implications further in next year’s edition. And we promise you this: the perpetrators will be brought to justice. If you’re looking for the 2019 M+R Benchmarks Study, you’re in the right place… but not the right day. Check back on April 25! If you are interested in joining this group of hard-working, data-crunching, brunch-loving communicators, marketers, fundraisers, and campaigners, check out our open jobs. *For the purposes of this study, avocados, tomatoes, fruit salad, and parsley garnishes were all considered vegetables regardless of botanical classifications. Celery was counted toward alcohol, not vegetables, when part of a Bloody Mary, along with that thing where they just start putting whole green beans and like twelve olives and a radish in there. Mushrooms in an omelette would have been counted as a vegetable, but why would we order that when French toast is an option? **It is apparently important to note that most of our Bay Area participants hail from Oakland. They claim this is a significant qualifier and demanded that we include this footnote. Everyone else just kind of rolled our eyes like we do when they talk about “the 101” or how good In-n-Out supposedly is.